Background and objectives Little published information is available about access failure in children undergoing chronic peritoneal dialysis. Our objectives were to evaluate frequency, risk factors, interventions, and outcome of peritoneal dialysis access revision. Design, setting, participants, & measurements Data were derived from 824 incident and 1629 prevalent patients from 105 pediatric nephrology centers enrolled in the International Pediatric Peritoneal Dialysis Network Registry between 2007 and 2015. Results In total, 452 access revisions were recorded in 321 (13%) of 2453 patients over 3134 patient-years of follow-up, resulting in an overall access revision rate of 0.14 per treatment year. Among 824 incident patients, 186 (22.6%) underwent 188 access revisions over 1066 patient-years, yielding an access revision rate of 0.17 per treatment year; 83% of access revisions in incident patients were reported within the first year of peritoneal dialysis treatment. Catheter survival rates in incident patients were 84%, 80%, 77%, and 73% at 12, 24, 36, and 48 months, respectively. By multivariate logistic regression analysis, risk of access revision was associated with younger age (odds ratio, 0.93; 95% confidence interval, 0.92 to 0.95; P<0.001), diagnosis of congenital anomalies of the kidney and urinary tract (odds ratio, 1.28; 95% confidence interval, 1.03 to 1.59; P=0.02), coexisting ostomies (odds ratio, 1.42; 95% confidence interval, 1.07 to 1.87; P=0.01), presence of swan neck tunnel with curled intraperitoneal portion (odds ratio, 1.30; 95% confidence interval, 1.04 to 1.63; P=0.02), and high gross national income (odds ratio, 1.10; 95% confidence interval, 1.02 to 1.19; P=0.01). Main reasons for access revisions included mechanical malfunction (60%), peritonitis (16%), exit site infection (12%), and leakage (6%). Need for access revision increased the risk of peritoneal dialysis technique failure or death (hazard ratio, 1.35; 95% confidence interval, 1.10 to 1.65; P=0.003). Access dysfunction due to mechanical causes doubled the risk of technique failure compared with infectious causes (hazard ratio, 1.95; 95% confidence interval, 1.20 to 2.30; P=0.03). Conclusions Peritoneal dialysis catheter revisions are common in pediatric patients on peritoneal dialysis and complicate provision of chronic peritoneal dialysis. Attention to potentially modifiable risk factors by pediatric nephrologists and pediatric surgeons should be encouraged. Peritoneal dialysis (PD) is the initial chronic dialysis treatment modality for the majority of children with ESRD worldwide (1,2). The advantages of PD over hemodialysis (HD) include the ability to attend school on a regular basis, no need for regular blood access, fewer dietary restrictions, and better preservation of residual renal function (3). One of the key aspects of successful PD is a well functioning catheter (3,4). Despite continuous improvements in surgical technique and catheter design, catheter-related complications, such as peritonitis, catheter exit site/tunnel infections, pericatheter leakage, and mechanical dysfunction, can compromise the ability to perform PD in an optimal manner and often mandate catheter revision (3,5,6). Most published studies on PD access revision in children are limited by small sample size, and many show conflicting results (6–11). Because there is a paucity of published experiences on the frequency of, risk factors for, and outcomes associated with PD catheter revision in children, we used the International Pediatric Peritoneal Dialysis Network (IPPN) database to evaluate these issues in a large cohort of pediatric patients receiving chronic PD. The IPPN Registry collects prospective (baseline and every 6 months) information from pediatric PD centers worldwide. The participating centers are asked to enroll all incident and prevalent patients and enter data longitudinally until chronic PD is discontinued. Data input to the IPPN Registry is performed exclusively via an internet–based web platform (www.pedpd.org). Data entries are automatically checked for plausibility and completeness. Data protection is ensured by pseudonymized data input. Data pertaining to catheter characteristics include catheter type (Tenckhoff straight/curled, Toronto Western, Presternal, or other), number of dacron cuffs (one or two), subcutaneous tunnel configuration (swan neck or straight), and exit site orientation (downward, upward, or lateral). Additionally, timing of first catheter use (immediately, within 7 days after implantation, or >7 days after implantation) is recorded. Any access revision due to infectious or noninfectious access–related complication is reported. The economic wealth of each participating country was classified by per capita gross national income (GNI) in 2014 on the basis of purchasing power parity converted to international dollars using the tables published by the World Bank (http://data.worldbank.org/indicator/NY.GNP.PCAP.PP.CD). The registry protocol was approved by the ethical committees/institutional review boards as required at each participating center. Written parental consent and whenever appropriate, assent from patients were obtained. Mechanical dysfunction is any catheter dysfunction due to omental obstruction, catheter tip migration, or blockage by fibrin or blood clots. Recurrent access revision is subsequent access revision that occurs within 4 weeks of prior access revision. PD failure is change to HD due to persistent catheter–related infection, inadequate dialysis, or mechanical dysfunction. Data were checked for normal distribution by the Kolmogorov–Smirnoff test. Data are expressed as mean±SD for normally distributed variables and median and interquartile range (IQR) for non–normally distributed variables. Differences in group means (log transformed in the case of non-Gaussian distribution) were assessed by linear mixed models. Differences in proportions were assessed using the chi-squared test. Multivariate logistic regression modeling was used for the analysis of factors associated with revision or recurrence. Survival analyses were performed using Kaplan–Meier analysis and log rank significance testing. Extended Cox proportional hazard modeling was used to identify risk factors for PD failure. P values <0.05 were considered statistically significant. Data were analyzed using SAS version 9.4 (SAS Institute, Cary, NC). Between 2007 and 2015, a total of 2453 infants, children, and adolescents ages 11 days to 18.8 years old (median =10.5 years old; IQR, 3.4–14.2 years old) from 105 pediatric dialysis centers in 38 countries were enrolled into the IPPN. Data were generated from 824 patients from the time of dialysis initiation (incident patients), whereas in 1629 patients, the prospective observation commenced after chronic PD had already been established (prevalent patients). Table 1 shows the patient demographics and access characteristics at registry entry. Nearly all patients had a Tenckhoff catheter, the majority of which were characterized by a curled intraperitoneal portion (70%), two cuffs (85%), a swan neck tunnel (63%) and a downward–pointing exit site (55%). The most commonly used PD catheter (55%) was one with a curled intraperitoneal portion, two cuffs, and a swan neck tunnel. In 54% of patients, the catheter was first used for regular dialysis >7 days postimplantation. A total of 321 (13%) patients experienced 452 access revisions within the observation period of 3134 patient-years, resulting in the overall revision rate of 1 per 83.2 patient-months. The number of access revisions per patient ranged from one to five (1.4±0.8), with 238 patients experiencing one revision, whereas 50, 22, seven, and four patients underwent two, three, four, and five access revisions, respectively. Among the 824 incident patients, 186 (22.6%) underwent a PD access revision over a total of 1066 patient-years of follow-up, yielding a revision rate of 1/68.8 patient-months. Among the 188 revisions reported in this patient cohort, 83 (45%) took place within the first 3 months, and 154 (83%) were within the first year of PD. The percentage of incident patients requiring access revision was 10% within 2 months of PD catheter placement and 19% within 1 year of catheter placement. A greater percentage of incident patients initiating dialysis within the first year of life underwent access revision compared with older age groups (39% versus 17.7%; P<0.001). 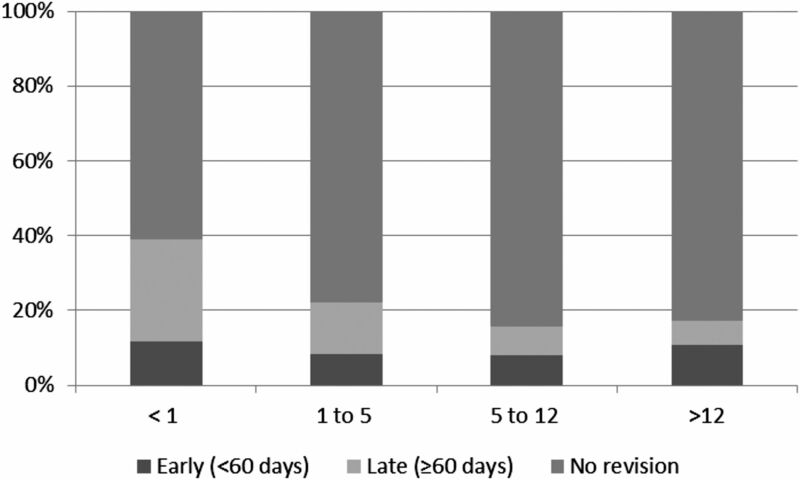 The percentages of patients who underwent early (<60 days) and late (≥60 days) access revisions by age are shown in Figure 1. Catheter survival rates (e.g., no need for revision) in incident patients were 84% at 12 months, 80% at 24 months, 77% at 36 months, and 73% at 48 months after PD catheter placement. The survival rate was significantly lower in infants compared with patients in the older age groups (P<0.001) (Figure 2). Percentage of incident patients requiring early (<60 days) and late (≥60 days) access revision by age (years) at dialysis initiation. Access survival in 824 incident patients according to patient age at catheter insertion. The survival rate was significantly lower in infants compared with patients in the older age groups (P<0.001). The median age at the time of access revision for all patients was 7.2 (IQR, 1.5–13.2) years old. Children who experienced a PD access revision were significantly younger at both dialysis initiation (6.6±5.8 versus 8.6±5.8 years old, respectively; P<0.001) and last observation (9.0±6.0 versus 10.58±6.0 years old, respectively; P<0.001) compared with patients who did not undergo a revision. The risk for access revision was associated with younger age (odds ratio [OR], 0.93; 95% confidence interval [95% CI], 0.92 to 0.95; P<0.001), diagnosis of congenital anomalies of the kidney and urinary tract (CAKUT; OR, 1.28; 95% CI, 1.03 to 1.59; P=0.02), swan neck catheter with curled intraperitoneal portion (OR, 1.30; 95% CI, 1.04 to 1.63; P=0.02), and the presence of coexisting ostomies (OR, 1.42; 95% CI, 1.07 to 1.87; P=0.01). In addition, the risk was higher in wealthier countries (OR, 1.10; 95% CI, 1.02 to 1.19; P<0.01) (Table 2). Additional analysis revealed that lower GNI was specifically associated with a lower risk of access interventions for infectious (OR, 1.20; 95% CI, 1.01 to 1.32; P=0.03) but not noninfectious causes. Centers from low-income countries, such as China, India, and Nicaragua, reported fewer infection–related access interventions, whereas their bacterial peritonitis rates did not differ from other sites. The reasons for access revision included mechanical dysfunction in 270 (60%) patients, PD fluid leakage in 29 (6%) patients, peritonitis in 71 (16%) patients, and exit site or tunnel infection in 54 (12%) patients. In 28 (6%) patients, the reason was not reported. The distribution of reasons for access revision by catheter type is shown in Table 3. Swan neck catheters with a curled intraperitoneal portion had a significantly higher percentage of catheter revisions secondary to mechanical dysfunction and peritonitis compared with other catheter types. Overall and within the first year of PD, the need for access revision was most commonly associated with mechanical problems, whereas infectious complications were the predominant cause for revision at >1 year after PD initiation (Figure 3). Characterization of 452 access revisions by indication and time on peritoneal dialysis (PD). ESI, exit site infection; tunnel inf, tunnel infection. Among 424 access revisions with information on type of intervention, 301 catheters were removed, whereas 123 underwent surgical revision without removal. In patients with mechanical dysfunction or leak (n=299), procedures conducted included one– or two–stage catheter exchange (n=192; 64%), relief of obstruction (n=57; 19%), or catheter repositioning (n=50; 17%). In revisions because of infectious complications (n=125), a two–stage catheter exchange was performed in 61 (49%) patients, whereas simultaneous catheter removal and replacement took place in 48 (38%) patients. Thirteen (10%) patients underwent cuff peeling, and three (3%) had granuloma excisions. The distribution of interventions is shown in Table 4. Recurrence of access revision (access revision within 4 weeks of prior revision) was reported in 50 patients, and 38 (76%) of these recurrences took place after a prior revision because of mechanical dysfunction. Overall, 16% of interventions because of mechanical dysfunction were followed by a subsequent revision within 4 weeks. During the observation period, 35 patients died, and 32 patients were switched to HD due to ultrafiltration failure or persistent infection. The need for PD access revision was associated with a higher risk of PD failure or death (hazard ratio [HR], 1.35; 95% CI, 1.10 to 1.65; P=0.003) independent of the presence of malnutrition (HR, 1.38; 95% CI, 1.1 to 1.7; P=0.003) or the diagnosis of CAKUT (HR, 1.17; 95% CI, 1.01 to 1.35; P=0.03). The need for access revision due to mechanical dysfunction doubled the risk of technique failure compared with infectious causes (HR, 1.95; 95% CI, 1.20 to 2.30; P=0.03). Actuarial technique survival rates at 1, 2, and 3 years were 91%, 83%, and 61%, respectively, in patients with an early (<3 months) access revision compared with 100%, 89%, and 89%, respectively, in patients with a late (≥3 months) revision (P=0.02) (Figure 4). Peritoneal dialysis (PD) technique survival in incident patients (n=186) with early (<3 months) versus late (≥3 months) access revisions. Successful PD requires a reliable access to the peritoneal cavity with a well functioning dialysis catheter. Among features potentially influencing catheter performance are catheter type, exit site orientation, placement technique, timing of first catheter use, and exit site care. Ideally, the placement technique, the characteristics of the PD catheter, and the care of the catheter should result in few mechanical or infectious complications. Key catheter design characteristics include the shape of the intraperitoneal portion (straight or curled), the subcutaneous tunnel configuration (swan neck or straight), and the number of cuffs (one or two). Whereas the majority of pediatric patients who initiate chronic dialysis worldwide are prescribed PD, limited data exist on PD catheter complications, treatment, and outcome in children. The availability of these data from >2400 children in the IPPN database facilitated our analyses of these important clinical issues. In our series, 13% of all patients and 23% of incident patients required one or more access revisions during their course of PD within the period of observation. These rates are much lower than those reported by the Italian National Registry, in which 34% of catheters required removal during an observation period of 754 patient-years (5). The percentage of patients (10%) in the IPPN Registry who underwent early catheter revision was also lower compared with previously published data (8,11). Most importantly, compared with Italian Registry data from 2004, we observed improved short– and long–term catheter survival (78% versus 88% at 1 year and 44% versus 77% at 3 years) (5). Provided that the results observed here are not biased by gross under-reporting, this improved outcome is likely related to better surgical technique and a decreased incidence of infectious complications due to improved exit site care and the immediate treatment of exit site infection/tunnel infections and peritonitis in accordance with published consensus treatment guidelines. The catheter survival rate was, however, significantly lower in infants compared with older children, a finding consistent with the results of other pediatric studies (12–15). Significant risk factors for access revision consisted of young age, the diagnosis of CAKUT, coexisting ostomies, the presence of a swan neck tunnel with a coiled intraperitoneal segment, and high GNI. The predisposition for young patients to experience access complications or failure may be related to a number of factors, including a lack of substantial abdominal musculature, the use of diapers, and the presence of immunodeficiency (e.g., low IgG levels), which may increase the likelihood of infection (11,16–18). Other potentially contributing factors include poor nutritional status and the frequent presence of congenital abnormalities. CAKUT is the predominant cause of childhood ESRD, and patients with this disorder often require complicated urologic procedures, which can be associated with a higher risk for infectious and mechanical complications and associated catheter malfunction. Because there are major regional differences in PD practice and outcome associated with economic welfare, we speculated that GNI might have an effect on the risk of access revision (19). The unexpected finding that high GNI was associated with a higher risk of access revision was not explained by differences in the patient age distribution or kidney disease spectrum, which differed by GNI and showed independent associations with access revision risk by multivariate analysis. Because the risk attributable to GNI was related to infectious rather than noninfectious causes of access revision, we speculate that recently established PD centers in low-income countries might adhere more consistently to published antibiotic prophylaxis guidelines, thereby efficiently lowering the risk of access infection. This hypothesis will be addressed through the collection of additional prospective data by the IPPN. Nutritional support in pediatric patients is often accompanied by gastrostomy feedings, and our analysis revealed the presence of any ostomy to be associated with a 55% higher risk for catheter failure (P<0.01). This is consistent with the results of other studies showing decreased catheter survival and an increased frequency of infectious complications in patients with any type of ostomy (20–23). Advanced surgical planning for PD catheter and gastrostomy button/tube placement is extremely important, and discussions between surgery and nephrology team members should address the optimal timing of both procedures and the need for prophylactic antibiotic/antifungal therapy (24). Somewhat surprisingly, Tenckhoff curled catheter with a swan neck tunnel was associated with a significantly higher risk for access revision, a finding that has not previously been recognized in the pediatric PD population (25–28). However, two recent randomized, controlled trials (RCTs) in adults have shown that the presence of a curled intraperitoneal segment may be associated with a higher rate of catheter tip migration (29) and access dysfunction requiring catheter replacement (30). The fact that mechanical dysfunction was the most common reason for access revision for Tenckhoff catheters with swan neck tunnel argues for a limited number of surgeons at any once pediatric center placing PD catheters because of the infrequent nature of the procedure. It is noteworthy that the 2013 Cochrane meta-analysis of 13 RCTs revealed no difference in the incidence of exit site infection, tunnel infection, peritonitis, catheter migration, leakage, and removal rate between coiled and straight catheters (31). As for exit site orientation, we did not find any association between exit site orientation and access revision rate (32). An additional key factor that influences catheter function is timing of first catheter use. Both the International Society for Peritoneal Dialysis (ISPD) and European guidelines recommend a break-in period of 10–15 days between insertion and first catheter use to prevent early leaks (24,32). In our series, timing of dialysis start did not predict access revision. The incidence of dialysate leakage in our dataset was also similar in association with early (<7 days) and late (≥7 days) PD start. The implementation of measures, such as application of fibrin glue, low fill volume, and short dwell times, in the setting of prompt dialysis initiation may have contributed to the similar leakage rates that we saw. The predominant etiology for access revision in our series was mechanical dysfunction, and catheter obstruction has previously been documented to be the most common reason of catheter failure resulting in access revision (8,11). Mechanisms of obstruction have included omental wrapping or blockage by fibrin or clots. However, in the largest pediatric review of catheter performance to date, infections were identified as the most frequent cause of catheter failure (5), accounting for 75% of patients. In our data, only after the first year of PD did infections become the predominant reason for access failure. Information on prophylactic antibiotics use at the exit site over time was not available to determine whether this practice had any influence on the frequency of infection–related access revisions in our cohort. The ISPD pediatric consensus guidelines suggest a two–stage catheter removal and reinsertion in patients with the diagnosis of fungal, enteral, or refractory peritonitis in contrast to simultaneous removal and placement in the case of relapsing peritonitis (32). In our series, 65% of patients with a revision secondary to peritonitis had a two-stage procedure, whereas 35% underwent simultaneous exchange. The success of these interventions is reflected by the finding that there were no subsequent access revisions due to peritonitis within 4 weeks of the initial revision. In contrast, the highest rate of intervention failure was reported in patients with mechanical dysfunction, with 16% of patients requiring a subsequent revision within 4 weeks of the initial revision procedure. Additional efforts to better define the reasons for the repeated dysfunction will require collaboration between nephrology and surgery. Finally, the need for access revision was most importantly associated with a 34% higher risk of PD failure, independent of patient age or the presence of an ostomy. 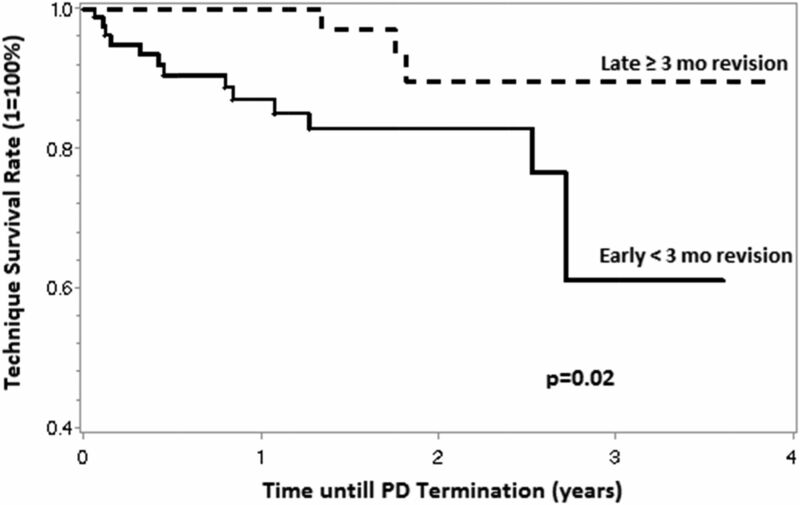 The technique survival rate was also significantly lower when the access revision was performed within 3 months of PD initiation. This experience emphasizes the importance of meticulous attention to surgical technique and postoperative catheter care, which have been emphasized in pediatric guidelines and recently, by the Standardized Care to Improve Outcomes in Pediatric ESRD (SCOPE) collaborative (33,34). A limitation of our analysis is that information on the surgical placement technique and whether an omentectomy was performed at access placement was not available. Although studies in adults, including RCTs, have shown an improved catheter survival rate and a lower incidence of infections and leaks subsequent to the introduction of laparoscopic placement (35,36), many studies in children have failed to show such a relationship (10,37,38). As for omentectomy, the procedure is performed in 60%–80% of PD catheter placements in children (39), and many studies have shown a significant reduction of catheter occlusion when routine omentectomy was performed (11,40). Collection of data pertaining to surgical technique and performance of omentectomy will soon be instituted within the registry. In summary, this analysis provides global insight into pediatric PD catheter performance and the need for revision and has identified potentially modifiable risk factors that might lead to practice improvement in addition to several nonmodifiable risk factors. Our data provide evidence that mechanical dysfunction remains a common cause for access revision and mandate attention by our surgical colleagues. Additional multicenter studies are also needed to compare outcomes of surgical techniques and short– and long–term catheter care strategies. We believe that the continued collection of data regarding catheter placement and function should ultimately permit the development of evidence-based guidelines designed to further improve the performance of chronic PD in children. We acknowledge Dr. Mabel Sandoval Diaz from Hospital Infantil de Nicaragua, in Managua, Nicaragua, who contributed to the manuscript. We also appreciate the continued dedicated support of the International Pediatric Peritoneal Dialysis Network (IPPN) by the medical and nursing staff in all collaborating centers. We acknowledge the support by the International Society for Peritoneal Dialysis, Baxter Health Care, and Fresenius Medical Care. Principal investigators of the IPPN Registry are listed in the Supplemental Appendix. This article contains supplemental material online at http://cjasn.asnjournals.org/lookup/suppl/doi:10.2215/CJN.05270516/-/DCSupplemental.